Create ringtones on Audiko.net! 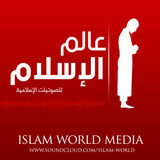 Simply download a free ISLAM WORLD عالم الاسلام ringtones for your iPhone or mobile. Specify your favorite passage from your favorite award-winning track - أجمل تلاوة في العالم - وخشعت الاصوات للرحمن - للقارئ ناصر قط, الشيخ سليمان الجبيلان والبنت الأجنبية الجميلة - مقاطع أسلامي, أذكار الصباح بصوت الشيخ ياسر الدوسري, or any other track. You are free to have your ringtone both in the MP3 and m4a formats, supported by both mobile phones and iPhones. Just select a track, and choose free ISLAM WORLD عالم الاسلام ringtones download option.